We strive to capture the true essence of a wedding through our lenses, documenting the timeless moments and range of emotions with our photojournalistic approach to wedding photography. The best part, for us as documentarians, is knowing that there are never any shortage of ethereal moments that take place in the course of a wedding. Be it the anticipation of the first look, or the craziness during the late night partying- weddings are full of human emotion - that too of the full range, from rolling tears to broad smiles. Our part is to make sure we be 'present' while these magical moments take place and that we capture core meaning of these moments for years to come by. 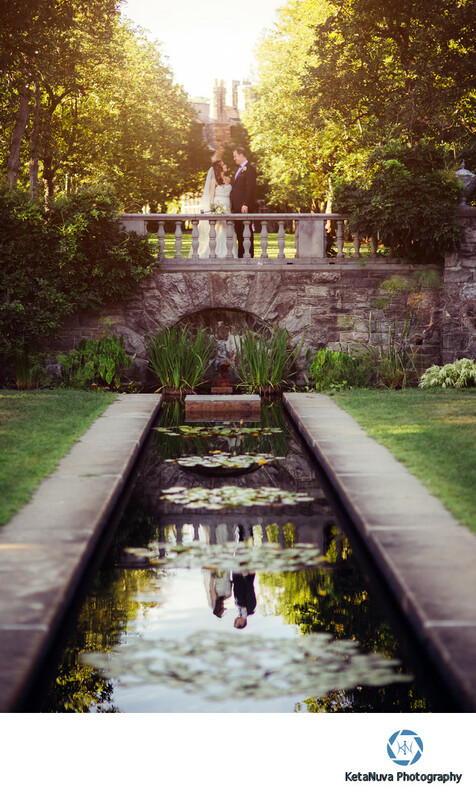 This photograph was taken in the beautiful New Jersey wedding venue, Skylands Manor. This was taken during late afternoon light, when the sun is an a low angle in the horizon and casts a beautiful golden glow, only known us the golden hour in the photography community. Portraits taken in natural light during this time tend to look great. Location: Ringwood State Park, 5 Morris Rd, Ringwood, NJ 07456.